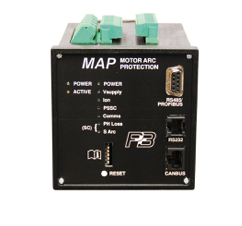 P&Bs MAP Relay is a patented motor protection characteristic allowing the unit to respond to a developing arc or resistance condition within the motor or circuit tails. By doing so it can protect against potentially developing and damaging overload conditions. Proving short circuit protection that is sensitive at ¼ FLC and during a motor start. MAP enhances the protection of motors in Mining, Oil, Gas and Petrochemical environments by providing a novel method for low level short circuit and series arc conditions. Proving short circuit protection that is sensitive at ¼ FLC and during a motor start, before the short circuit level current has a chance to develop large enough for conventional short circuit relays to operate and potentially cause damage to your equipment. Unlike other available ARC detection devices, P&Bs MAP does not require or rely upon optical sensing. It uses conventional CTs and VTs to measure current and voltage just like a normal motor overload protection relay. The relay monitors the motor currents and voltages and calculates the inter-phase angles, the patented algorithm operates within a normal induction motor characteristic, if the phase angle moves out of the normal zone the protection activates. Protection extends along the entire cable run from the switchgear source to the motor. To respond to such fault conditions normally requires the current to be higher (often several times) than the normal load current in the circuit for the protection relay to operate. This is where P&Bs MAP method is advantageous, it is sensitive at ¼ FLC meaning it can activate and provide protection before the load current develops into fault current and reaches dangerous and equipment damaging levels. It is worth recognising that one of the most common causes of electrical faults is not the switchgear or the motor, it is due to faults relating to the cable and junction points between the source and the load. What can it do in practice? MAP is developed to mitigate the risk of ignition sources within faulted cable caused as a result of overload, insulation breakdown, poor connections or broken conductors by detecting the conditions prior to a high level circuit current, or where a fault condition exists and in which it cannot develop to a typical fault current. Series arcing in a conductor will be at load current which conventional overload protection cannot detect. This makes the MAP protection relay an extremely valued pre-cursive function which operates prior to an actual short circuit level arc from occurring or fully developing. This method highly is attractive for underground or overground intrinsically safe and hazardous area installations. The application is a method of providing low level short circuit current protection on long cable runs or as a means of detecting intermittent or loose connections in the source to load cable. The primary benefit for Motor applications is the ability to discriminate and detect this condition even during motor starting, providing far faster tripping than that which is typically provided from the thermal overload protection. Because of the behaviour of MAP it will also inherently detect single phasing faults and unbalance conditions. In addition to enabling the short circuit tripping function to operate below full load current, without the need to compensate or discriminate for high starting current. The difference between a stalled rotor and a high starting condition is determined not by magnitude but by phase angle measurement. Prior to MAP this distinction required a very expensive rotation detector. Unexpected phase angle readings can also provide an early motor fault development to the maintenance engineer. The MAP relay can be supplied as a stand alone device which can be retrofitted to supplement existing starter protection or designed in to new build equipment.